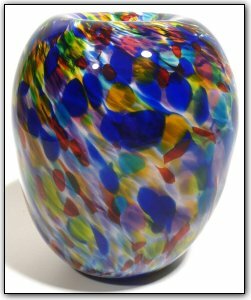 This urn is from the End Of Day® series, meaning it is made with a variety of colors used throughout the day, and contains nearly every color in the rainbow. This urn also contains a matching lid making it suitable for a cremation urn. The lid measures 3.5" tall and is 3.75" wide.